Pretty Indulgent is a Canadian e-tailer for all kinds of great stuff: Nail polish like China Glaze, OPI, Zoya and Nubar as well as some great handmade bath and body lines like Villainess (a personal favorite of mine) and Arcana. Pretty Indulgent has recently started carrying Black Phoenix Alchemy Lab perfumes, and among them are four limited edition Pretty Indulgent exclusive scents. The four scents are designed to celebrate the culture and history of Quebec, and one of them is dedicated to the celebration of Halloween in Montreal, and that's what I'm reviewing today. "When Halloween comes to Montreal, winter doesn’t lag far behind. Trick-or-treating is done in mad, giddy dashes between houses, an exhilarated rush in the darkness. The air is crisp, sometimes biting, and more than one toddler waddles through the eve, bundled in a snowsuit beneath their inevitably rotund costumes. Chimney smoke and woodstove fires, and all the classic scents of Halloween – loads of candy, leaves, cold earth, smashed pumpkins left over from Mat Night’s debauchery – are sharp and clear in the frosty air. 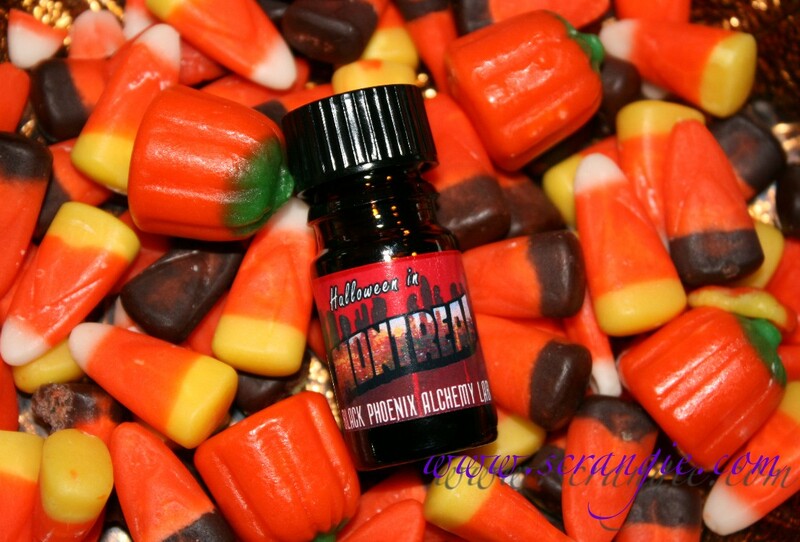 La fumée de cheminée et toutes les odeurs de l'Halloween - bonbons en masse, feuilles mortes, terre gelée, citrouilles écrasées - parfument l'air glacial." The very first time I smelled it, I smelled strong pumpkin and earthy leaves. I wore it for a few hours and then set the bottle aside for a few days so I could think about the scent. I've just tried it again after a few days of not smelling it and I get a completely different impression. Cold air and sweet, sticky pine sap. Straight from the bottle, I smell syrupy pumpkin and maple, icy air, and pine needles. On my skin, the pine needles come to the forefront and the whole thing smells green and icy. Sap, pine needles, snow, cold air. The pine in this is not sharp and chemical like cleaning products, it's fresh and realistic like sitting next to a Christmas tree. There's a quick hint of a creamy, edible pumpkin, but it disappears shortly after application. After a while, the pine settles down and a soft sweetness emerges. This may be the candy that's noted in the description, but it's not strong or particularly sweet. It's a delicate, sugary sweetness, not necessarily a candy-like fruity or baked type of sweetness. It seems to provide a smooth and somewhat soft base to what is otherwise a very crisp and outdoorsy scent. Beyond the sugar, ice and pine, I get a very fleeting impression of woodsmoke. Dry and warm, very cozy, but very subtle. It balances the cold and sweet nicely. After a few hours on my skin, the whole thing blends to a cool sweetness with no detectable single notes. It reminds me in a way of Black Phoenix Alchemy Lab Snow White, which is cold and sweet, but this is softer and more sugary. It's a really nice scent that perfectly captures that change from fall to winter. It's not just an interesting scent, it's actually a wearable, flattering scent to wear. And what's more, it's very unlike any perfume you will smell in a store or on someone in a crowd, and that's what I love about Black Phoenix Alchemy Lab. Every scent is not the standard nondescript-fruity-floral-migraine hell that dominates the mainstream fragrance market. These are definitely in a class of their own. Black Phoenix Alchemy Lab Halloween in Montreal is limited edition and available exclusively from Pretty Indulgent. I live in Montreal and now im really intrigued by this scent. Fall is my favorite season, and I love the idea of a perfume that capture the smell of fall here in Quebec. I think I'm going to order this! I just wanted to say your fragrance reviews are a total delight to read. The way you describe every aspect of the fragrance makes each one sound captivating. I hope you continue to do the occasional fragrance review, I really love them! S.N., wow, thank you! That makes me really happy. I love doing all sorts of beauty-related reviews so that makes me super happy to hear. Thank you again! I love Pretty Indulgent! (Full disclosure, they carry some of my work, but I am also a regular customer.) Maggie ships super quickly and has awesome customer service... plus she has great taste in nail polish! I'm a Montrealer, and Halloween is my favourite holiday. I think I need to get myself some of this! That sounds delightful. I've never ordered from this company. Looks like I need to. Yes, that's me! :) So glad that you found my work drool-worthy. What a compliment! I am always glad to read your BPAL reviews! This one sounds like heaven - seriously, right up my alley. Have you ever tried Arcana? I like their scents also, I have their Sleepy Hollow and I have a feeling you'd like it. Nicole, Thank you :D Yes, I have tried a bit of Arcana! I've tried a couple of their soaps, but I also have a handful of oils. Sleepy Hollow (LOVE), Haint, Filthy Viking (also LOVE), Ganesh, Madame Lapin, Frozen Heart, Solstice Sugar, Molly Malone, The Ulda, Frilly Underpinnings, Pushpadhanva, Caffeinated Death and a few samples.